Ideal Tax Solution, LLC is strongly recommending that any taxpayers who have not filed their 2009 tax returns do so by Monday, April 15, 2013. By filing, taxpayers may be eligible for part of the over $917 million which is available for almost 985,000 taxpayers. When we explain the benefits of attaining taxpayer in good standing status, most clients jump at the opportunity. Ideal Tax Solution, LLC is informing its clients and all potentially eligible taxpayers to prioritize filing their 2009 tax returns if they have not yet done so. The IRS provides most taxpayers a three-year window of opportunity for claiming a refund. If no claim is filed to claim a refund within that window, the money becomes part of the U.S. Treasury. The Internal Revenue Service does not apply penalties for filing a late return if it qualifies for a refund. The IRS will withhold any refunds owed to them or any state tax agency. The refunds can also be applied to any unpaid child support or past due federal debts such as student loans. 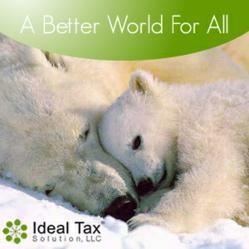 In addition, the IRS and the tax professionals at Ideal Tax Solution are reminding taxpayers their refund checks can be held if 2010 or 2011 returns have not been filed. By failing to file a return, taxpayers stand to lose more than tax refunds paid in 2009. Many low-to-moderate workers may not have claimed the Earned Income Tax Credit (EITC) for that year, which totaled as much as $5,657. The tax help specialists at Ideal Tax Solution can assist taxpayers in determining the amount of credit to which they are entitled. EITC helps taxpayers whose incomes fall below certain thresholds. More information on 2009 tax refunds can be found on the IRS website or by contacting the tax liability specialists at Ideal Tax Solution.